Great Southwestern proudly offers three Department of Labor Bureau-accredited appreticeship programs for employees desiring to become Transmission Linemen ( Line Installer Repairer Program), Distribution Linemen (Line Repairer Program) or Substation Technicians (Electrician Substation Program). Our Substation Technician Certification Program is provided through the Northwest Lineman’s College (NLC) Power Delivery Program, and is most commonly used as the curriculum component of apprenticeship leading to journeyman certification, and is ideal for adoption or endorsement by utility company associations and statewide organizations. Apprentices receive the most current training and information available, and testing is conducted via the NLC website. Up-to-date testing records are maintained in Great Southwestern’s apprenticeship department which provide a comprehensive and accurate record of each apprentice’s stage of training. If you are a current employee who is interested in any of our Apprenticeship Programs, please see your supervisor for more information. Do you want to start your career right after high school? 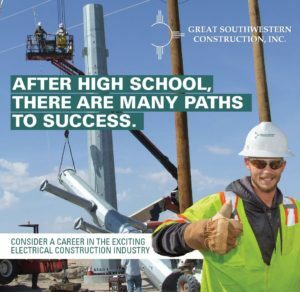 Great Southwestern Construction (GSWC) proudly offers paid apprenticeship programs and career opportunities. Learn more here. Earn Extra Money During Your Apprenticeship with Great Southwestern! If you are a veteran or currently in the guard or reserve, our Apprenticeship Programs offer you a way to use your GI Bill’s education and training benefits. While enrolled, you may be eligible to receive monthly VA training benefits in addition to your regular salary. Email rtrammel@myrgroup.com for more information. We are proud to offer our Substation Technician Certification Program through Northwest Linemen’s College (NLC). Learn more about NLC’sgoal to provide “The Benchmark Standard of Training”.